Imagine a space where creators of all sorts- artists, engineers, programmers, tinkerers, inventors- can come together and work. Imagine a space where any tools or materials imaginable are there to be used by anyone with a spark of an idea that they want to make reality, whether that idea be a hardwood table, a new iPhone app, a guitar made out of reused junk, or even a fully functioning robot. It’s not just imagination. This concept is the spirit of what’s been called the “Maker Movement”- and is touching down only minutes away from RiverPark. 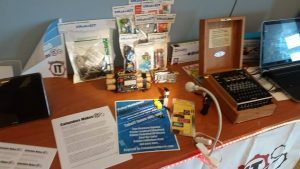 The “Maker Movement” is a subculture that encourages people to not merely be placid consumers of products, but to be creators, or “makers” of innovative things or content. 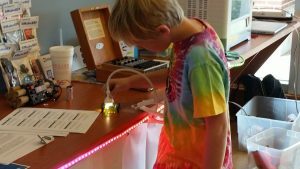 Maker clubs and meetup groups have been sprouting across the nation for years, and a few cities now have dedicated “maker spaces” that act as a sort of hub space for creators.These spaces are filled with hardware, tools, materials like wood and metal and fabric, as well as robotics components, 3-D printers, and even LEGO bricks. ColumbusMakesIT is one of these spaces, and it’s open this summer to the public directly across from CSU’s Coca-Cola Space Science Center. The center will have resources for people to work on robotics, sculpture and pottery, fabric and metal work, as well as 3-D printers to help inventors develop and build prototypes for products that they might want to bring to market. After the product is done, ColumbusMakesIT plans to help those inventors work their way into the business world to sell their new products. But it’s a bit more than that, say the founders. A great benefit of having a space here in town is the sense of community. A lot of people that know founder Frank Braski (pictured below, talking) see the “IT” and automatically – but mistakenly – think that it stands for Information Technology and is pronounced “I.T.” (like Eye Tee) but it really is a placeholder for whatever “it” is that you want it to make. “From glassblowing, to 3-D printers, to bead making, to woodworking, all these people are looking for a place to share what they’re doing with each other,” says Jim Livingston, another co-founder of the center. As for how much it will cost to use the space, there will be basic day use and monthly memberships that include up to 4 days of usage for as little as $20 a month for a 6 month commitment. There will also be family and long-term project storage and co-working arrangements available. People will be able to purchase memberships, with different levels allowing use of different equipment. 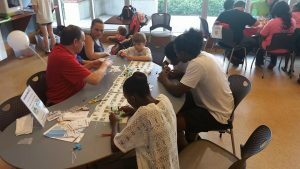 The center is also hosting “You MakeIT” camps starting in July, where people will be able to do anything from build their own cigar-box guitar to create a longboard to ride off to class with. Camps and classes like these will help ensure the center, which is a nonprofit organization, remains sustainable. 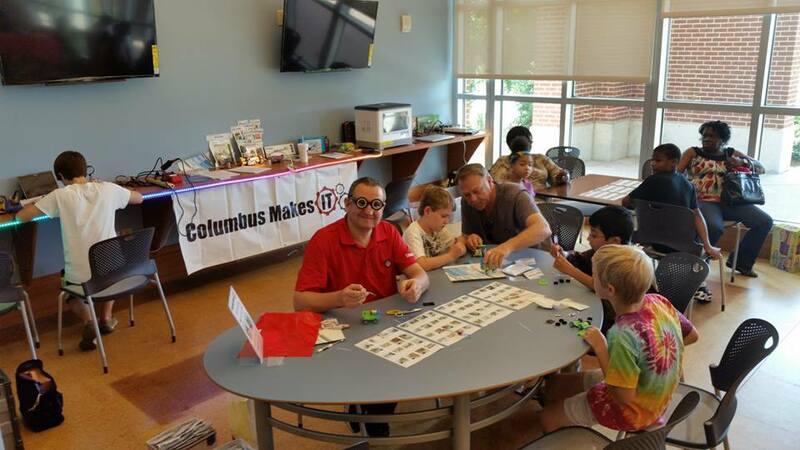 ColumbusMakesIT was written up two weeks ago by The White House on their inativites, click here to read more. 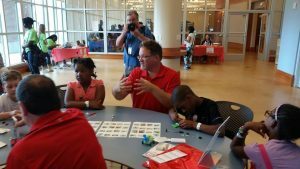 “We celebrate the tinkerers and dreamers whose talent and drive have brought new ideas to life, and we recommit to cultivating the next generation of problem solvers. Last year, at the first-ever White House Maker Faire, I called on leaders around our Nation to join in sparking a grassroots renaissance in American making and manufacturing. 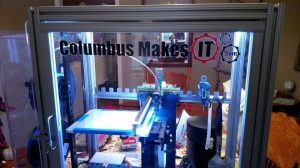 *ColumbusMakesIT is looking for donations and volunteers. 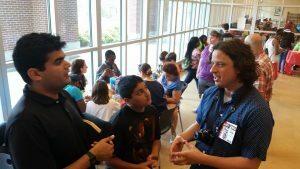 They are looking for volunteers to help teach classes, as well as old/new computers, woodworking tools like drills/miter saws/hand tools/planers, etc., electronics tools like soldering irons/voltage meters, etc., robotics stuff like servos/actuators/motors, etc., sewing machines, servers, etc., legos, transistors, resistors, etc., and raw materials like wood/metal/screws/fabrics/thread. For equipment donations contact Frank Braski at 404.324.7508 or David Hehman at 706.412.9817. *Pictures provided by ColumbusMakesIT, thank you!